Just as gloves and hands come in mirror-image pairs (a left and a right), many molecules can exist in ‘left-’ and ‘right-handed’ forms (see figure). This property of handedness is called chirality, and most biological molecules are chiral. Surprisingly, all living organisms contain almost only ‘left-handed’ amino-acids and ‘right-handed’ sugars. This exclusive one-handedness has the important consequence that proteins and DNA are chiral, and that the biological and pharmaceutical activity of many molecules is often directly related to their chirality. Figure: Chirality in the amino-acid alanine. 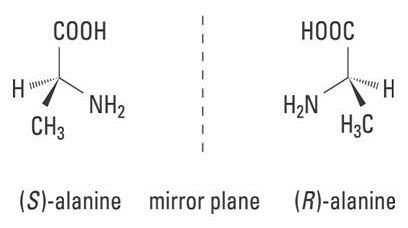 Structures of the two mirror-image forms. The image is part of the information on the 2001 Nobel Prize in Chemistry. To give a few examples: We need sugars in our diet, but if we were to eat the mirror image of these sugars, molecules that contain the same atoms but only arranged in the left-hand form, then we would starve, as our body can only metabolize the right-hand form. This is for instance utilized in some artificial sweeteners, such as Tagatose or Natrulose, that are the mirror-image of milk-sugar and that taste sweet, but that we cannot absorb and that therefore have zero calories. Similarly, the two mirror-image forms of a chiral molecule may have very different smells, such as with spearmint and the spice caraway, which tastes like cumin. More dramatic and crucially important is chirality in many pharmacologically active drug molecules. Examples of well-known chiral drugs are for instance ibuprofen, the anticoagulant warfarin, and several antibiotics (e.g. quinolones and b-lactam), to name but a few. The book “Chiral Drugs” by Wiley lists 2500 known chiral drugs. Often the biological activity of the drug is related to its handedness. One form may be helpful the other may be inactive or even toxic. Examples are: only one form of dopamine is effective in the management of Parkinson's disease, the other causes granulocytopenia (reduction in white blood cells), or one form of thalidomide alleviates morning sickness, whereas the other form may cause birth defects. Therefore it is absolutely crucial to be able to identify the correct form of the chiral molecule if it is to be used as a drug. 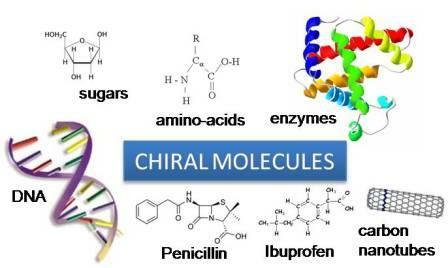 Today, most new drugs and those under development are chiral. In its 2002 cover story “chiral roundup” Chemical & Engineering News, reports that in 2000 the chiral drugs market is worth $ 133 billion. Due to new guidelines from agencies such as the FDA, the development of single enantiomer (only one of the two mirror-image forms) chiral products are a major priority. This in turn requires technological developments in the synthesis, separation and detection of chiral molecules. Our research addresses all three areas. Among other, we are developing physical techniques for the synthesis and separation of single enantiomers, and we are developing new optical probes that are sensitive enough to distinguish between the two mirror-image forms of a chiral molecule. L.D. Barron,"Molecular Light Scattering and Optical Activity", Cambridge University Press, (2004). G. H. Wagnière, "On Chirality and the Universal Asymmetry: Reflections on Image and Mirror Image", Wiley-CH, (2007). I.C. McManus, "Right hand, left hand", Harvard University Press, (2002).